I am just starting to use essential oils… Thank you for this informative Post. Love this topic! I am a huge fan of essential oils and I also use a diffuser! That’s great! I’m glad you like them as much as I do. I have a collection of essential oils and some soya melts but just cant find the right difuser. The reed difuser is very pretty!! I need to check that post out! The reed diffusers are great because they are so inexpensive and easy to make, you can put them in every room of the house. I bought a diffuser on Amazon last month and it is the best thing I’ve done in the new house! I got sick of wallflowers and candles to minimize the dog smell from our pup (which isn’t that strong thankfully) and I am astounded by the aromas from the oils and how long it lasts before refilling! Don’t they work great? And they aren’t the “fake” smells you get from a lot of candles and plug ins. I really want to make some diffuser beads now as a blog post–thanks for the inspiration! Cool! I would love to see it! This is such a cool post. 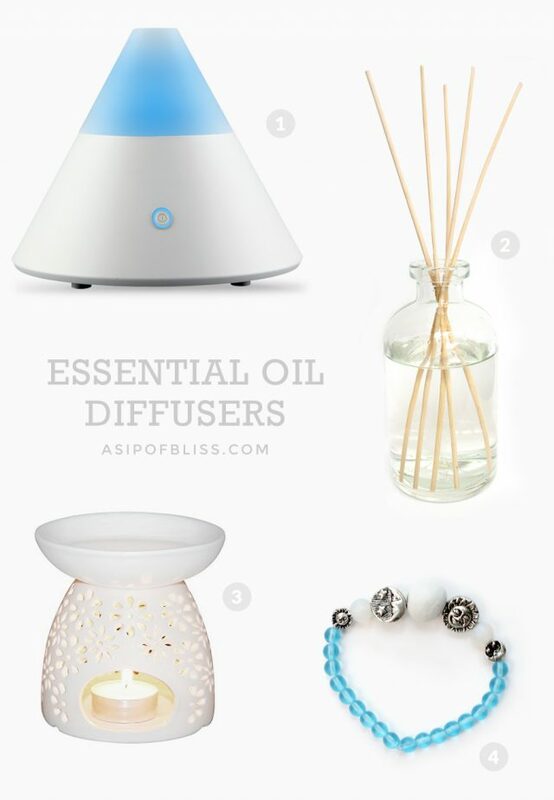 I have never heard of Ultrasonic Diffuser or Diffuser Bracelet. Very interesting and informative. Thank you for sharing! When I first started with EOs I had no idea there were so many different kinds of diffusers. And these are only a few. I love my electric diffuser. It is so convenient! I’ve been wanting to try essential oils for a while… I’ll definitely refer to this once I get started. Thanks for sharing! Great Lauren! I hope you try them out soon. Great post! I wil have to check out the bracelet. I use a diffuser similar to #3 all the time, but in the winter when we have a fire going most of the day I just fill a mug with water and put some drops in there, it works great. I love the idea of diffusing oils on your jewelry, I’ve seen different products for that lately and I think it’s a terrific idea! The mug of water is a great idea! I have put a few drops in a pot of water on the stove before. It works great. I love essential oils as well and this is why I own the candle diffuser. I picked that one because of the aesthetics, it really looks beautiful along with creating a wonderful atmosphere according to the essential oil I pick. First time I hear about the jewelry one, it seems interesting indeed! Great reviews, thank you! I agree. I really like the look of the candle diffusers!